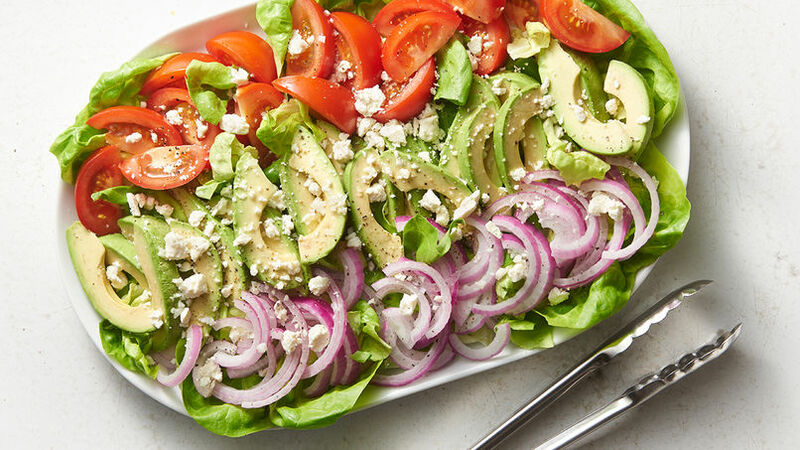 Arrange a layer of lettuce on serving dish, with tomatoes, avocados and onions on top of it. Crumble the Feta cheese and drizzle garlic lime-infused vinaigrette to finish it. Make vinaigrette by combining vinegar, lime juice and mashed garlic together and whisking olive oil slowly so that they are well incorporated. Add salt and pepper to taste. Presentation matters! Arrange the tomatoes and avocados in rows or in groupings to create a visual impact. Use the squeezed limes for the vinaigrette as garnish. Valentine’s Day is quickly approaching and menu planning is already on my mind. With family and friends gathering in my home to celebrate, I want to fill their bellies with the warmth and love I feel for them. I also take this opportunity to instill our family’s Cuban heritage in my children. A typical Cuban salad is the best opening for a feast. However, I promise you this recipe is anything but typical! Topped with crumbled Feta cheese and garlic lime-infused vinaigrette, this Cuban Salad is fancy enough for any celebration.